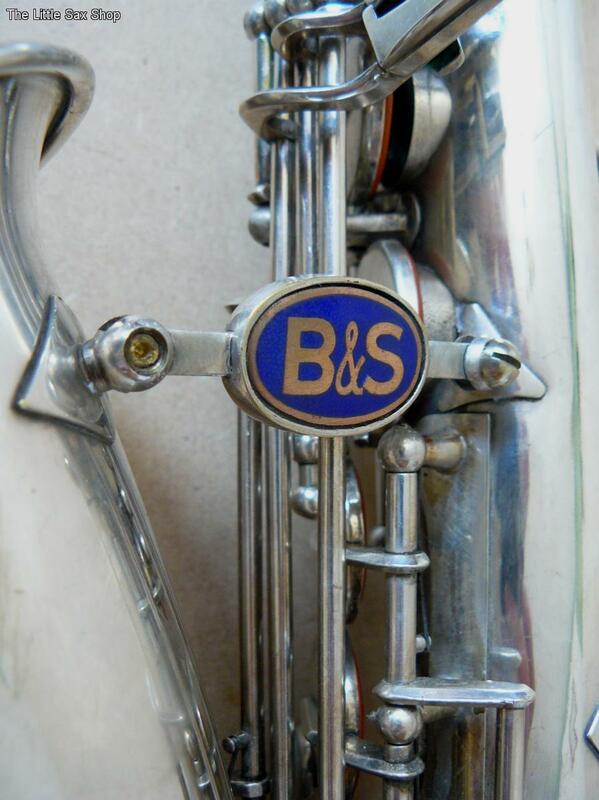 “Blue label” alto saxophone by B&S Serial # ?. Source: Mark Wiseman. The VEB Blechblas- und Signal-Instrumenten-Fabrik (B&S), was created on January 1, 1953. It was formed through the merger of 3 VEBs: the Sächsische Musikinstrumentenfabrik (formerly Ernst Heß Nachf. ); the Signal-Instrumenten-Fabrik Markneukirchen (Max B. Martin); and the Vogtländische Etuifabrik Adorf (Walther). In 1974 3 more firms came under the B&S umbrella, these were: Sonora (formerly Oscar Adler); Spezial-Holzblasinstrumente Markneukirchen (Mönnig); and Holzblasinstrumente Schöneck (G. H. Hüller). Finally in 1984, the 7th, and final, firm was added to B&S: Sinfonia.